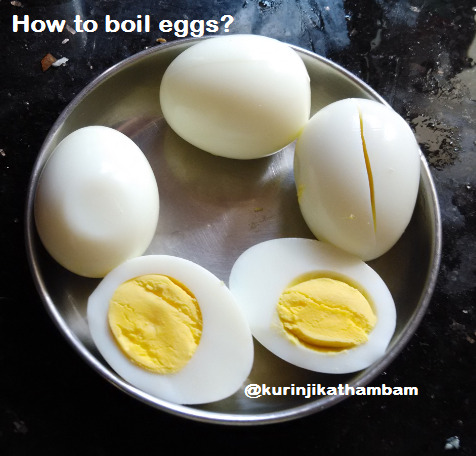 How to make hard-boiled eggs using pressure cooker? Normally we boil eggs using sauce pan. But the trouble is that we have to keep on watching over the eggs. Instead using pressure cooker is a better idea. It helps to save time and effort. 2. Add the water and salt in a pressure cooker. Then place eggs carefully in the pressure cooker. The salt helps to remove the shell of the eggs easier. 3. Close the lid of the cooker and wait till the pressure has come out. Now just rotate the cooker carefully once or twice. This step helps to remove egg white and yellow separately. 4. Pressure cook for 1 whistle in a medium flame. Then switch off the flame. Allow it to cool down completely. 4. After the pressure has gone, open the lid of the cooker and take out the eggs and allow it to cool down. 5. Then peel the egg shells carefully. Now the hard boiled eggs are ready.